Armenian diaspora’s idealist opposition to Turkey-Armenian negotiations is understandable, but an outright rejection of the dialogue process is a missed opportunity to introduce ideas and strategies that would empower Armenia. One of world’s ancient nations and one of its youngest states, Armenia celebrated its 18th anniversary as an independent republic on September 21, 2009. No country in history has persisted so much invasion, persecution, and genocide. No country has continuously existed for so long as Armenia has. And even though today’s Armenia is small, weak and has a declining population of already less than three million, today’s Armenia is one of the best times Armenia has had in thousands of years. Today is Armenia’s gift, and that gift must be used wisely. Already a young adult, Armenia lives in a world with little room for mistakes. It must democratize, stabilize and normalize its relations with its historic foes to survive in times when today’s errors will be hard to erase tomorrow. As bad as Armenia may seem today, it has the opportunity to invest in a great future. As the new Armenia is celebrating its entrance to adulthood, its ongoing negotiations with Turkey are in the center of international attention. There have been many articles and discussions on a subject which divides a lot of people, who I will “divide” into two camps – pragmatists and idealists. Armenia’s current administration, and perhaps most of the citizens in the Republic, wants to normalize relations with Turkey for economic reasons. These are the pragmatists, for who Armenia is the only permanent address they have known, and who want to have a normal social life. I understand this group well. This is the group that is Armenian every second of their life. This is the group that wants to change, improve Armenia and is willing to take the risks. This is the group that ultimately takes all the risks. I also understand the second group – the idealists. These are the diasporans for whom the Armenian genocide is the centerpiece of Armenian identity. The diaspora would never exist in the first place if there was no genocide. Diaspora’s opposition to the Turkish-Armenian ‘normalization,’ thus, is natural. These are the people that won’t forget how Turkish governments repeatedly lied to Armenians, and how the most trusted of those, the CUP, ended up carrying out the Armenian genocide. These are also the Armenians for who genocide awareness is often the road to staying Armenian. 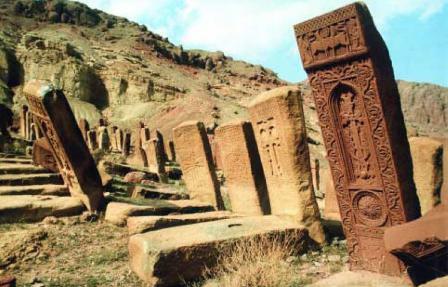 Diasporans have to fight day and night to keep the Armenian identity – unlike the Armenians in Armenia, who – no matter what they do – are Armenians every second. I understand both groups. I love both sides. I am a son of the genocide itself and a son of the young and small Armenia living in the Diaspora. But when it comes to making a choice for Armenia’s future, I have to be a realist. The reality is that Armenia’s population, at its best, will stay 3 million for the next decades. Turkey’s 71 million population and Azerbaijan’s 8 million will keep growing, coupled with the rise of ethnic Turkic Azeris in northern Iran. Unless Armenia finds a language with these inconvenient neighbors, it could face the danger of a final genocide. Finding a common language, to be clear, has nothing to do with forgetting the Armenian genocide. The pragmatists, taking a market-ly speaking neoliberal approach, think that free trade will bring dialogue, and dialogue will bring genocide recognition. The idealists, on the other hand, say that genocide recognition should come first. As noble as the latter sounds, the former seems to make most sense. “Once the border opens,” Turkish historian Taner Akcam told me a few years ago, “Armenians and Turks will find out that they have more things in common than they thought: they have the same daily problems, and none have horns.” He surely belongs in the pragmatist camp, not only in the Armenian but also in the Turkish sense. While the latter is the only point that deals with the genocide, the issue of Nagorno-Karabakh is the most realpolitik task and requires immediate attention. 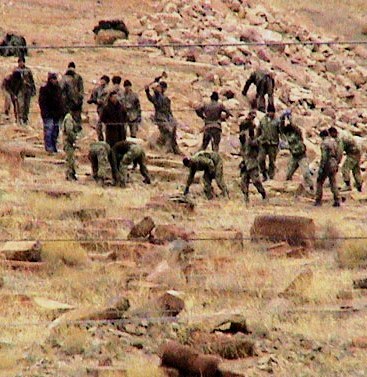 The idealists, overoccupied with genocide recognition, have long neglected the question of Nagorno-Karabakh – the indigenous Armenian region claimed by Azerbaijan. Turkey remains the biggest obstacle in reaching peace in the Nagorno-Karabakh conflict that will guarantee the security of the region’s indigenous population. If Turkey wants to normalize its relations with Armenia, it must stop being pro-Azerbaijani when it comes to the Nagorno-Karabakh conflict. It must declare itself neutral in the conflict and say that it will honor any decision reached between Armenia and Azerbaijan. This is the chance for the idealists to make a difference in the normalization process. It’s time to tell Turkey that for Armenians to choose the pragmatist approach – open border first, dialogue second and reconciliation third – Turkey must become objective in the Nagorno-Karabakh process. 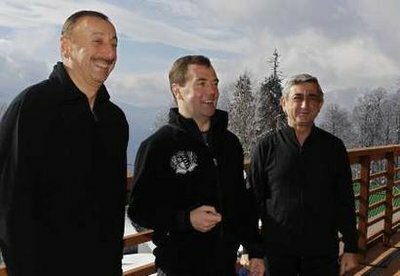 And when Aliyev was asked optimistically if Davos 2009 might be the first step toward establishing formal diplomatic ties between Baku and Yerevan, Azerbaijan’s president rejected the suggestion. Aliyev said his country does not have relations with Armenia because of the “continued occupation of our territory by Armenian armed forces,” though negotiations continue. “But unfortunately, as Prime Minister Erdogan said, for the last 17 years these negotiations did not lead to a resolution of the conflict. It did not lead to a peace agreement and it did not lead to the liberation of Azerbaijani territory — the internationally recognized territory of Azerbaijan,” Aliyev said. Taken together, the January 29 events at Davos demonstrate more than just the failure of the forum to bring together uneasy adversaries. The angry exchange between Peres and Erdogan shows that public debate between government leaders at Davos also can damage bilateral relations between two countries considered allies. And Aliyev’s outburst suggests his country is ready to adopt the tone set by its regional mentor, Ankara. Actually, Aliyev was the first one to set an angry tone, not Erdogan.